Cross River State University of Science & Technology, Calabar (CRUTECH) cut off mark for 2017/2018 academic session is officially out. Cross River State University of Science &Technology (CRUTCH) potential students are expected to go through this notification carefully. Before we get started on what this years cut off mark is, please be informed that there is a very clear difference between Cross River State University JAMB cut off mark and Cross River State University post UTME cut off mark. Cross River State University post UTME cut off point may not matter any longer since the the Federal Government have scrapped post examination. However, you will be on the winning side if you can still prepare for post JAMB examination in case the management of Cross River State University insist on conducting any form of screening or post UTME before accepting new applicants. 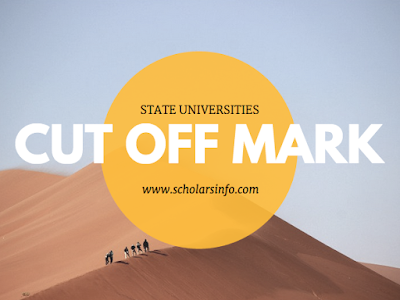 What is the JAMB cut off mark for Cross River State University? In order to help candidates, we have decided to reveal the Cross River State University 2017 cut off point so that anyone who does not meet up with the specified cut off mark will make hay while the sun shines. Judging from our experience last year during the 2016/2017 academic session admission, we found out that some candidates who purchased Cross River State University post UTME were screened out on the exam day because their jamb results was not up-to the required cut-off mark. To prevent this kind of issue in time, this notice advises such candidates to look for an alternative university by buying the JAMB change of institution form while the form is still on sale. The cut off point for Cross River State University for 2017/2018 academic session is 120. Hence, it is important that candidates who chose Cross River State University as their choice of institution but scored less than 120 should not buy the admission form but rather inquire if there is any course that is suitable for your JAMB score before making payment for the 2017 admission form. Note: Post UTME cut off point for Cross River State University varies from one course to the other. The cut of mark for the different courses will be made known by the institution in due time. Quit buying the admission form at the moment as there is really no room for JAMB score less than 110 but proceed to obtain a pre-degree form directly from the school. For those who scored 120 and above in their JAMB UTME result, you have to be on alert as the sale of the Cross River State University’s sales of admission form will commence soonest. What is the cut off point for Cross River State University? JAMB is yet to update us with any new changes with Cross River State University cut off mark for 2017/2018 academic session. Stay tuned! This page will be constantly updated in case there is any change in the cut off point. Wishing you good luck in your quest for admission this year. Put your email and phone numbers in the comment box below to receive any new changes and updates on Cross River State University Cut Off Mark as well as admission details.